You will find gardeners often complaining that their charming verdant gardens are often visited by unwanted guests – aphids, ants, rats, cockroaches and flies. These are the usual pests that often raid your gardens and cause destruction to your favorite flowers and veggies. How about tackling this issue of pests naturally? Well, the most natural and Eco-friendly way to repel pests from your gardens is to plant these pest repelling plants that will solve all your pest problems. Lavender is one among these below showcased plants that repel flies, mosquitoes and fleas. It is a plant that exudes a delightful aroma and is regarded as a blessing for such gardens that are often attacked by insects. Though, lavender’s fragrance is loved by humans, the insects get repelled by it as they cannot tolerate it. Choose such locations to plant lavender that get ample sunlight. If you have a garden on your terrace, plant the lavender in pots or containers. Featuring in most cuisines of the world, basil is also an excellent pest repelling plant. For a mosquito and fly free garden, you must plant basil, either in pots or in soil. Known as Ocimum basilicum, this plant smells pungent. Its strong aroma poses a deterrent for mosquitoes and flies that hate it. If you have a veggie garden and want to grow tomatoes that taste nicer, then plant basil plants along with the tomato plants. Some varieties that are most effective in tackling mosquitoes are cinnamon and lemon basil. If you are looking forward to having a cockroach free garden, then plant catnip for sure. The catnip is a perennial herb that is counted as one among the most effective plants that repel roaches. The catnip plant is most hated by roaches, and even mosquitoes, aphids, beetles and ants. The Lemon Balm plant is used for a number of medicinal uses. Apart from its medicinal properties, this plant is known to repel mosquitoes. It produces flowers that smell of lemons, courtesy, the cintronellal compound that is contained in it. Most insects and pests hate this lemony smell and usually avoid going near it. Most gardeners plant this in pots or garden beds that are close to sitting decks or patios. A great mosquito repelling plant, Rosemary can be grown easily in pots or in the soil. Its a great looking plant that most people grow in their gardens. The Rosemary plants look gorgeous when grown in garden beds or in herb gardens. Plant these gorgeous beauties in such places that are frequented by mosquitoes. The strong smell will deter these winged creatures from coming near you. The best part about Rosemary is that you can use its cuttings too to repel insects. A great mosquito repellent, Marigold is a good slug deterrent too. These gorgeous orange flowers are great repellents for pests and can be planted in pots or garden beds. If you have a veggie garden where you grow tomatoes, plant Marigolds as these will keep away such insects that eat them. Insects hate the smell of Marigolds and keep themselves away as much as they can. Chrysanthemums are one among the many plants that repel roaches apart from other bugs like lice, mites, Japanese beetles, silverfish, fleas and ticks. These flowers are a blessing for gardens that are often raided by these appalling pests that cause damage and are also an eye sore. Chrysanthemums contain a compound called Pyrethrum that is used worldwide in making pest repellents. The smell of this compound is non tolerable to most pests. If you have a huge growth of veggies in your vegetable garden like cabbage, tomatoes, collards, kale, broccoli and cucumber, then plant Nasturtiums along with these vegetables because these flowers repel a whole lot of insects like cabbage loopers, squash bugs, aphids and white-flies that prey on these veggies. Apart from being used widely as a flavoring agent in many cuisines, Mint is also grown to repel mosquitoes from gardens. It is also considered one of the most effective plants that repel ants. It contains such a fragrance that is detested by most insects. You can plant Mint as a companion plant with other plant varieties to keep insects away. Lemongrass must be planted in gardens that complain of mosquitoes as it contains citronella oil that is naturally offensive to these pesky creatures. Lemongrass plant can grow up to 4 feet in height and looks very ornamental. It can either be planted in a pot or on a garden bed with soil that drains well. Gardeners vouch for this plant that grows easily as a garden soil cover and repels pesky insects like wire-worms and aphids. This plant grows as grass and offers a protective layer to your soil that also houses other kinds of plants. Most aphids and wire-worms detest going near clover. For a veggie garden that has cabbages, plant clover around them to deter cabbage worms from damaging the cabbages. One can find more than 300 varieties of this plant. Among plants that repel ants, the name of Common Yarrow features prominently as this perennial produces a pungent aroma that is disliked by ants and other pests. One must plant Common Yarrow in such places that are often attacked by rodents and other kinds of pests. However, this plant attracts non harmful insects like ground beetles, lacewings, spiders, hover flies and ladybugs. Gardeners plant Petunias as companion plants to tomatoes, corn, beans, basil and peppers as these have insect repelling properties. They are hated by leaf-hoppers, asparagus beetle and tomato worms among a host of other bugs. Even aphids detest Petunias. Pest repelling plants like Chives are very effective in driving away aphids, Japanese beetles and carrot flies. Chives or Allium schoenoprasum is a very small type of onion that can be eaten like other onions. The plant reaches just 50 cms in height and is used as a spice in many cuisines around the world. Do you know that Oregano, the most famous spice to be used in many cuisines is also a great insect repelling herb? Well, now you know! Oregano can easily deter insects like cabbage butterfly, mosquitoes and cucumber beetles from wrecking havoc in your garden. 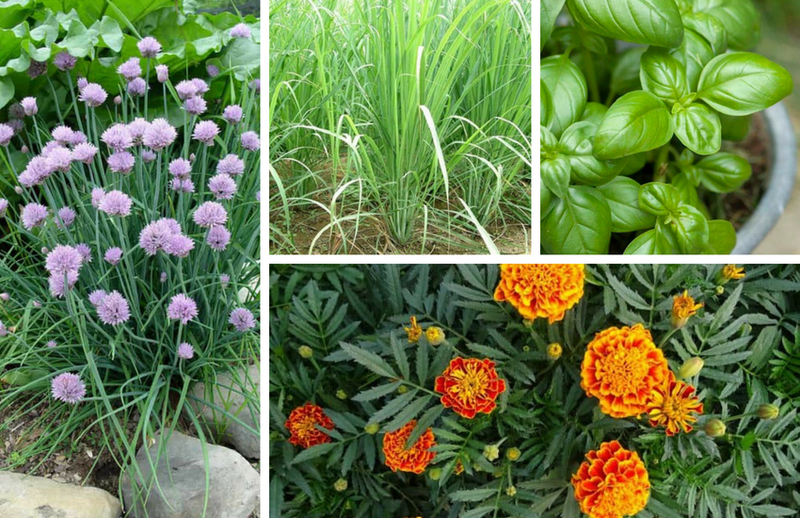 It can be planted as a companion plant to onion, chives or garlic to repel all these kinds of insects. However, oregano is often attacked by other bugs like leaf-hoppers and aphids.